How to Potty Train Your Puppy in 7 Days! Two Crate Training Schedules! Home \ How to Potty Train Your Puppy in 7 Days! Two Crate Training Schedules! 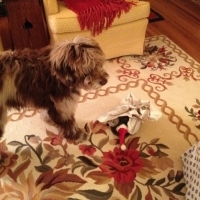 Lack of house-training usually stems from giving a puppy too much freedom, too soon. 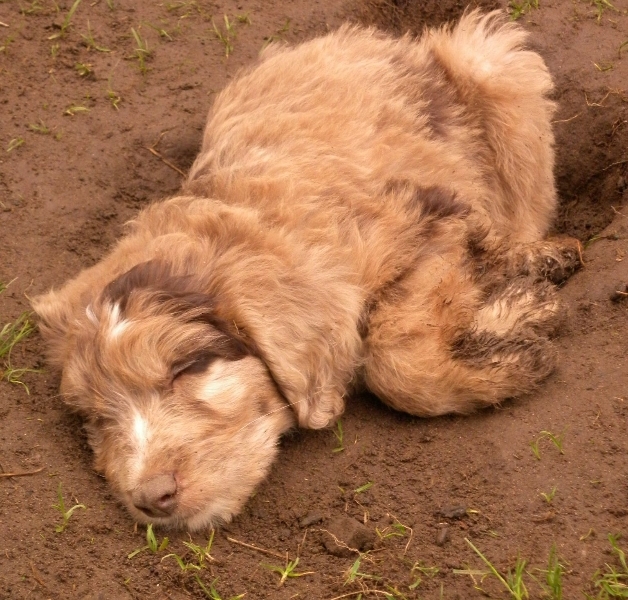 Puppies should be going potty outside consistently before giving them full access to your home. MINI AUSSIEDOODLE “GOOSE” IN THE LEAVES! WHY CRATE TRAINING WORKS SO FAST?  Crate training has been proven to be the fastest way to potty train a puppy. Why? Simple. 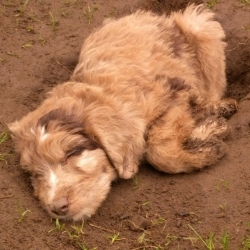 Dogs don’t like to sleep in their own waste and are natural den animals. 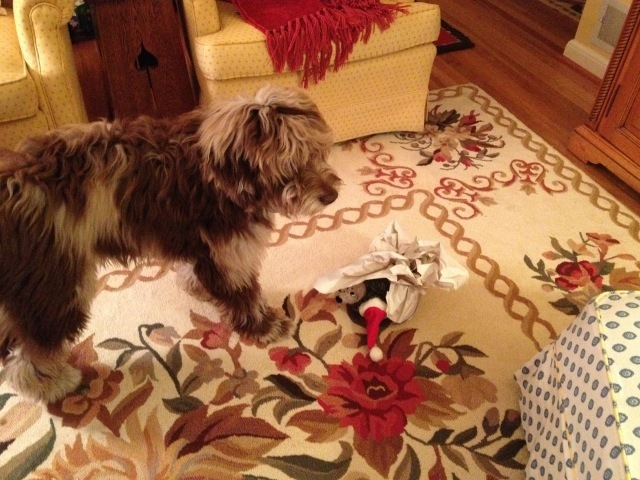 Crate training just uses a dogs natural instincts to our advantage. Some people may think crate training seems cruel, Potty Training your puppy with a crate, is not cruel. Getting mad at your untrained puppy for pooping on your rug is cruel. Letting them run around the house and just hope they’ll figure it out..someday. Sure, that might work but usually takes much longer.. and I’m sure you’ve also met a couple adult dogs who’s owners have never fully potty trained them!  Crate Training sets you & your puppy up for success! It teaches them when and where you want them to go potty – it doesn’t take long and it just works. PERIOD! When crate training is done right, consistently and on a set schedule, it only takes a couple weeks to see huge progress then you can leave their crate door open because you’ll have a better idea when they need to go and they know where their supposed to go potty. Also teaches them how to “hold it” and that it’s OK to be alone sometimes. Crates are not intended to be used as a punishment. Crates are training tools, safety enclosures and of course there’s some pretty logical time limits for how much time you should be left in a crate. Crate Duration: 2-4 hours max for an 8-16 wk old puppy – basically about 1 hour per month of age – the majority can go 6-8 hours at night (once they’re on a proper schedule). INCLUDED BELOW: are a few example potty training schedules you can use to “potty train” or housebreak your puppy in 7 days – 2 weeks may be a more realistic goal. 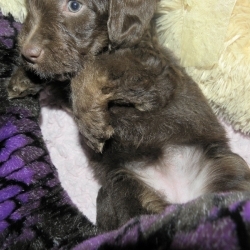 #1 Potty Training schedule is for puppy owners who are HOME all day with their puppy. #2 Potty Training Schedule for people who WORK all day. These 7 day potty training schedules may seem a little restrictive and I agree, they are strict but thats the point! The goal is to get them on a STRICT eating/eliminating and sleeping schedule QUICKLY and they’re perfectly safe. You can easily modify them to fit your life or work schedule and individual puppies patterns as soon as you know them better. Write down how long it takes for your puppy to go potty after eating to help figure it out. 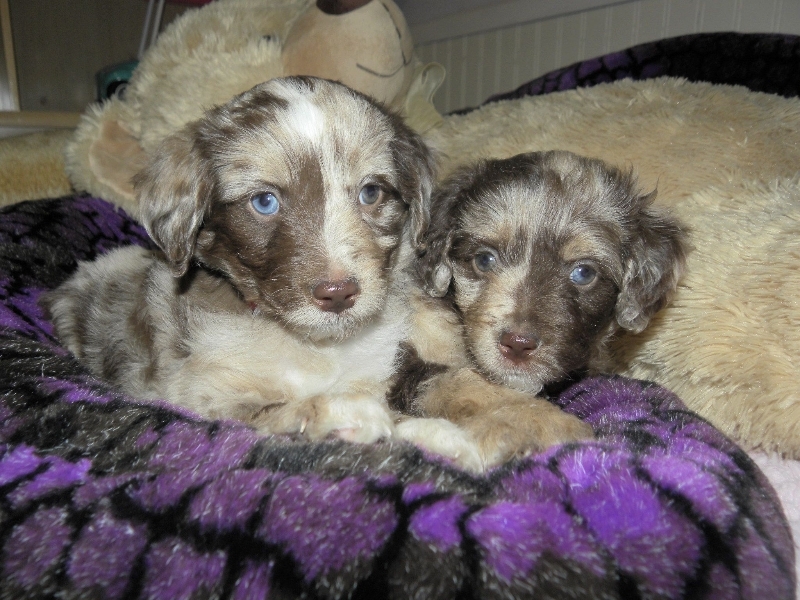 Each puppy is unique and will react differently to crate training. Some will be easier then other. Most Puppies will CRY at first and some puppies are way more dramatic and much louder then others, so try to introduce your puppy slowly to the crate, the first day home is best but it’s never to late to start (first time should be during the day when you’re not as sleepy) give them some fun toys, Yummy Chew Treats, chew bones and a stuffed animal to cuddle and you can also feed them in their crate..The goal is to give them a positive association to the crate. Close the door. Sit quietly near the crate for five to ten minutes, and then go into another room for a few minutes. Repeat until you get some consistent quiet and then start the training schedule. Read my page on how to deal with a crying puppy in the crate. Make sure you STAY consistent with the training schedule you choose and the sooner you get them on one, the faster potty training will go. And I mean consistent, like clockwork.⏰ Even on the weekends. If you’re home all day, the crate training schedule can be much more lenient, you basically want to limit crate time to 1 hour per month of age (during the day) so for an 8 week old – 2 to 2 1/2 hours. The point of the schedule is to get their bodies adjusted to a set feeding/eliminating/sleeping schedule, learning to hold their potty and also coming in and out of the crate and sleeping in a crate. 9:00 pm –Crate Time, until 11 pm OR if your bedtime is closer to 10 pm, you can take them outside at 10 pm and then put them to bed at 10:10 pm instead of 11:00 pm. 11:00 pm – Go potty outside, if they don’t go within 10 mins, try again in 10 mins before they go back to the crate for the night. * Puppy may still wake up in the middle of the night to go potty the first two nights while their body is still adjusting to the new schedule. If they go both pee and poop by 10-11pm and their last meal was at 5pm, then they should be able to make it through the night by the 3rd or 4th night. No problem.  FIRST COUPLE DAYS: Write down how long it takes for your puppy to actually go potty and then adjust your schedule accordingly. * Puppy may still wake up in the middle of the night to go potty for the first 2 nights, while their body is still adjusting to the new schedule. If they went both pee and poop by 11pm and their last meal was at 9pm, then they should be able to make it through the night by the 3rd or 4th night. Best Way to Occupy Puppies Time In the Crate…Chews! WHY IS MY PUPPY STILL GOING POTTY IN THEIR CRATE? If you’re puppy is still going potty in their crate, then it’s usually due to a few different issues… all of which are in your control to fix.  They’re peeing on their bed and blankets, simply because they’re absorbent and its just not discouraging enough not to – versus no bed and having to sleep in an actual puddle of pee? Definitely not something they’ll want to do.. Remove the bed & blankets and replace them with a soft teddy bear to cuddle for now. You can give them their bed & blankets back once they’re fully potty trained. Perfect Teddy bear for a Puppy in the crate! Buy Him on Amazon Prime! 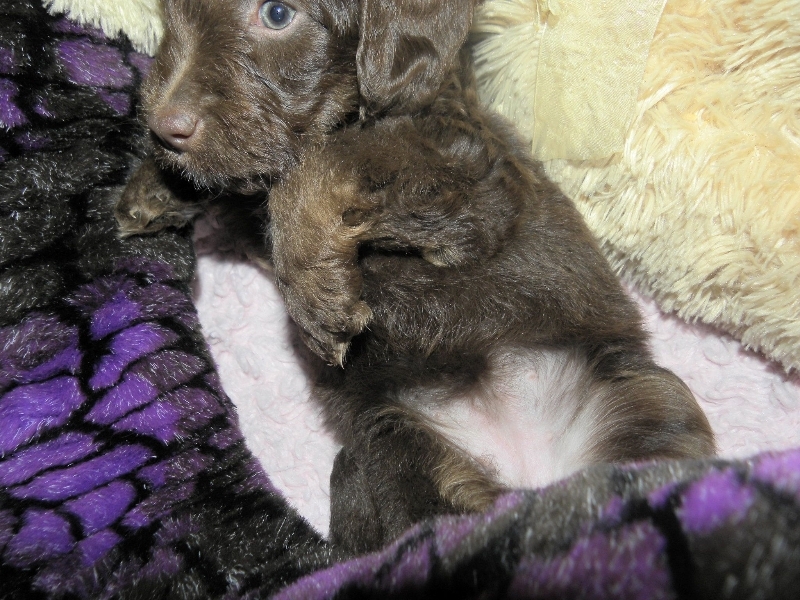  Until you figure out your puppies elimination schedule just keep following the Potty Training Schedules above, basically let them out every couple hours while also watching for gotta go potty clues – like circling, sniffing and whining. Once you have them on a set schedule, this all becomes much easier to predict and you can leave them out of the crate for even longer. HOW OFTEN DO PUPPIES GO TO THE BATHROOM?  Every puppy is different, some go right after they eat (within 10-20 mins), while others may take 30-40 mins (or even longer). An 8-week-old puppy will urinate approximately every three hours and a 12-week-old every four hours.  Some puppies only poop 1x a day, while others may go 3x to 5x a day. Depending on several factors like diet, stress, exercise.  DO NOT leave food and water out all day. Put them on a set feeding schedule and stick to it. If puppy doesn’t eat or just nibbles, this can be due to the stress of a new environment or even crate training the first week home, just keep feeding them at your set mealtimes. Eventually, they’ll adjust and they’ll also learn to eat when it’s time to eat. A puppy that’s allowed to graze all day, will also pee and poop all day! Leaving food and water out 24/7 will make potty training near impossible, they won’t be able to hold their bladder in the crate and you’ll be totally clueless when they might need to go. WHAT SHOULD I DO WHEN I TAKE MY PUPPY OUTSIDE TO GO POTTY? Use a release phrase when you let them out of the crate like “Let’s Go, Max” and then put them on a leash. With a leash, you have more control of them and also where they go in your yard and you can also see if they’ve gone or not (at night). Using a leash will give them more practice just walking on a leash, since most 8 wk olds never have. Use a cue phrase like “Go Potty, Max” include their name and just keep repeating that over and over until they go. Whatever phrase you use everyone in the family should use the same one and every single time. Use another “task complete command” like “YES! Good Boy, Good go potty outside Max”!! Give them a high value treat like raw chicken treats (or something they only get during training) you can also reward them with just affection, both will work but younger puppies do seem to catch on quicker when treats are involved. IF PUPPY DOESN’T GO RIGHT AWAY – If they don’t go within 10 mins, they probably just didn’t need too go yet, take them back inside and put them back in the crate, try again in 10-15 mins. When you put them back in their crate use another command like “Crate Max!” OR “Kennel up” or “Place” then they’ll eventually learn to go to their crate with just a verbal command. You can make up your own commands just as long as you use the same ones everytime. TEACHING YOUR PUPPY TO GO POTTY ON COMMAND! The whole point of using the same “go potty” phrase every single time is just like with any command, it’s so they eventually learn to “go potty” on command and BELIEVE ME IT WORKS and it does not take long for them to catch on. There’s nothing better, then when you’re out in the cold rain/snow or just late at night and you’re extra sleepy and you really NEED them to hurry up and go potty and LIKE MAGIC they listen to you?! YES! So, I call that a VERY USEFUL COMMAND to teach! Same with the “Crate” command, these are definitely two of the more useful commands. 欄 Not very often…do I feel the NEED to shake hands with my dog..but it’s still a fun one! TREATS & TOYS DURING TRAINING? Treats can become a slippery slope, puppies who are trained too long with treats can start to only obey a command they know well – if a treat is involved. That can become pretty frustrating. Treats are super helpful when teaching a new command BUT should be phased out during training once they know the commands. Treats should only be given after they perform a command. Even when you’re not training at least make them “sit” before giving them a treat. HEALTHY “HIGH VALUE” TRAINING TREATS – MEAL TOPPERS! My dogs and puppies love Instinct Raw Boost meal toppers! They make great high value treat for training and also great at encouraging picky eaters to eat! Puppies may have short attention spans but I promise, your puppy will pay very close attention to you with these secret weapons! They’re just freeze dried pieces of chicken and some fruit and veggies mix. Another Great Brand of Freeze Dried RAW Meal Toppers and treats… that puppies and dogs will pay attention for and are also healthy for them! STELLA AND CHEWY for the win! You can skip dinner after training with these, they’re meal toppers that can be feed alone, during training or just a few on top of their kibble to encourage picky eaters. Once your puppy has learned the new command, During a training session – start to phase out the treats by giving them a treat every other time, or every 3rd time they obey a command, replacing treats with physical & verbal praise. Become unpredictable when you’re gonna give them a treat or just a.. ‘YES! GOOOD BOY” verbal praise. The goal is they’ll perform the command or task consistently and regardless if treats are available. This doesn’t mean you should never give out treats “just because” but treats should also never become necessary for your dog to listen to you! 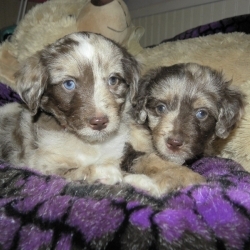 TWO AUSSIEDOODLE SISTERS PAYING CLOSE ATTENTION FOR A TREAT & A PICTURE! A great way to create a strong bond with your puppy is through training. Teach your puppy the basics as well as some fun tricks. And don’t forget to give them lots of positive reinforcement with verbal praise and treats. Get down to your puppy’s eye level, talking to them in a happy & upbeat tone of voice. Teaching your puppy the “watch me” command will also encourage great eye contact and bonding. The Whole Family Needs To Be Consistent When Training Your Puppy! When training a puppy everyone in the family should be using the same verbal commands, for example the “go potty” command and also helping to make sure your families new puppy is following the potty training and feeding schedule. A puppy should be secure about how his owner(s) are going to react to them from day to day as well as person to person, otherwise it’s easy for them to get confused about what’s expected of them..what’s ok and what’s not ok – with who and when? So, BE CONSISTENT. For example, if Dad let’s the puppy mouth and bite on his hands or jump up on him for “a hug” you really can’t get mad at the puppy when they try the exaxt same games with your kids or worse your visitors & their kids. Just be careful the behaviors you reinforce unintentionally, sometimes we can accidentally train our puppies unwanted behaviors, simply by not correcting them in time or not everytime, like “l’ll let it slide this time” and then next time they do the same exact thing… you get on to them. Letting them chew on some shoes but not “these shoes”. Also, you have to catch them in the act for them to understand why they’re in trouble. You can’t get onto them for something they did 20 mins ago. Learn more about the importance of consistent puppy training! NEXT STEP… THE CANINE GOOD CITIZEN TEST! Once you and your puppy have mastered basic obedience training & commands.. You can sign up them up to take the Canine Good Citizen test! The Canine Good Citizen Program teaches good manners to dogs and responsible dog ownership to their owners. The 10-step Canine Good Citizen test is a non-competitive test for all dogs. It is a prerequisite for many therapy dog groups. Whether you decide to take your puppy to a puppy training class like the 6 week programs they have at Petco or Petsmart, or you go to a local trainer OR you decide to just teach them at home is up to you. JUST DO IT SOMEWHERE! There are so many FREE puppy training resources online, like on YouTube for example. There’s just no excuse for not training your puppy. WHEN SHOULD I START TRAINING MY PUPPY BASIC OBEDIENCE COMMANDS? You should start training basic obedience commands like sit, down, come, leave it, watch me as soon as you bring puppy home! Just make sure each training sessions is reasonably short and include lots of WINS for your puppy and you’ll be surprised how fast puppies can learn! An 8-12 week old puppies attention span is still pretty short. Training sessions should last no longer than 15 mins at a time. You don’t want to loose your puppies attention or bore them, it should be fun for both of you! Don’t stress them out, with too much, too soon. You want every training sessions to end on a high note and a big win for your puppy! Puppies can learn simple obedience commands very quickly, for example you can teach an 8wk old puppy to “sit” in literally one or two – 10 min training sessions, using only treats and hand signals! Whatever commands you choose to teach, be consistent, always use the same verbal command and hand signals. Puppies seem to learn hand signals super easy, even faster then a verbal command, but you can train using both and eventually they’ll both click. Take advantage of this age! Puppies are like little sponges the first 4 months! Do not wait until they’re older, the best time is definitely NOW!! 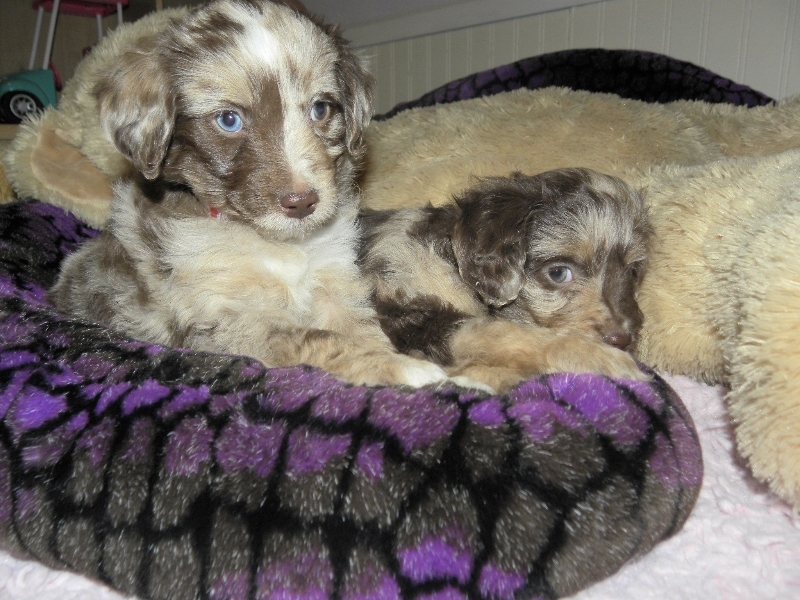 I recommend the 24 inch size crate for our mini Aussiedoodle puppies during crate training and they will also fit them into adulthood. MIDWEST ICRATE DIMENSIONS: 24L x 18W x 19H inch crate – ideal for dogs 13 – 25 pounds. 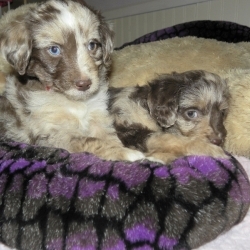 The smallest crate I’d recommend for our mini Aussiedoodle puppies is the 22L x 13W x 16H inches icrate, for 7 – 12 pound dogs they will most likely grow out of the 22 inch crate as an adult – but it will also be good size for training. 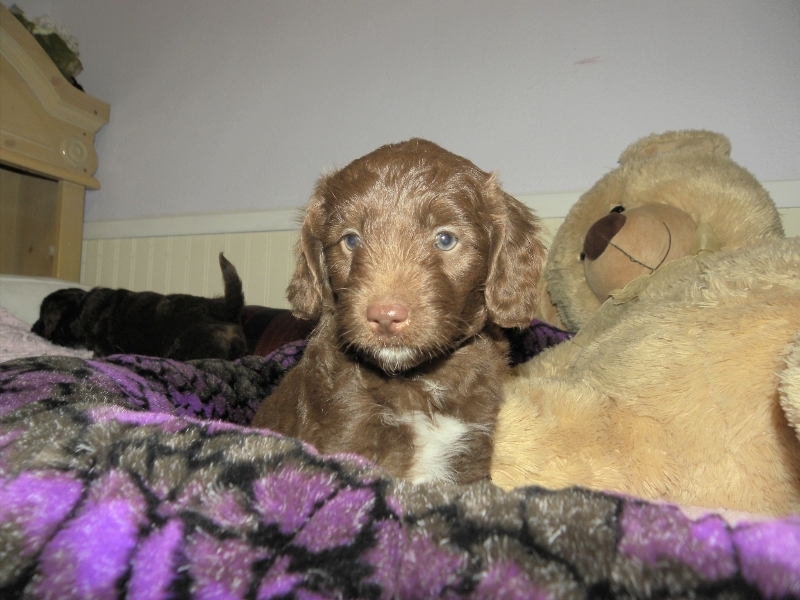 For our medium – moyen and standard size Labradoodle and Aussiedoodle puppies is the 30 inch iCrate during crate training and will fit continue to fit some moyens into adulthood. I recommend the 36 inch iCrate for our standard size adults and will work with a divider for puppies. MIDWEST I-CRATE DIMENSIONS: 30L x 21W x 24H Inche crate, for 26 – 40 pounds – for our larger standard size puppies they may grow out of this as adults (comfotably) but it’ll be a great size for training. The Plastic shipping crates, also work for crate training. Some puppies prefer them actually, I believe because they may feel more secure in them, while some hate them and like the more open feel of the wire crates. If your puppy is still hating their crate after a few days of trying..you can always try a different type of crate, location or setup. The puppy pen setups are also nice for free time out of the crate and for people who work, I would rather see people training their puppies to ONLY go outside but sometimes that’s just not possible so in those cases the x-pen setup may work for you. The Midwest X-Pens also connect easily to the Midwest I-Crates I recommenx above. These training schedules were originally published online by Jason F. Foster, DVM and Craig C. Meyer, DVM from Lake Travis Animal Hospital. 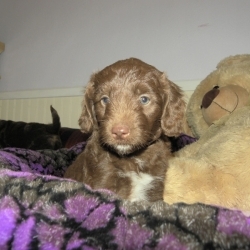 There are two extra schedules for puppies 3-6 months old below that are not included on this page, I only included the schedules that I thought would be most helpful for our Dreamydoodle puppy families.